Is your girlfriend’s birthday closer? Do you have something in mind for her? When a girl celebrates her birthday, she wants all her loved ones to share this happy moment with her. On her birthday, she will receive a lot of present and salutes from their friends and family; she will smile for all photos and be enthusiastic and happy but if her boyfriend don’t show up in this important day, her happiness will be incomplete. Don’t you know what to give her? Have you given her a lot of presents that you don’t know what else to give? There are some presents that don’t cost anything but they have a big value for the ones who get. Send a romantic letter to your girlfriend on her birthday. When reading this letter, she‘ll know your love is the best gift ever. Here you’ll find a pair of samples so you’ll have a clear idea of how to write a letter for this special occasion. I write this letter to wish you a happy birthday. In a day like this you came to this world to bring happiness to a lot people. I want you to know this is a very special day for me too because I like when you are happy, I love to see you smiling and to look at your eyes full of happiness. Since I’m with you my life seems a beautiful dream, your love changed everything inside me. Today is your birthday and I want to give you my life, it’s the only thing I have because my heart is yours since the day we met. Happy birthday princess, all the love I feel for you is in this letter, this words had been written while I was thinking in you, the most important person in my world. I wrote this letter because I want you to know I’m happy for your birthday. Today is a special day in your life and it brings happiness to my soul. My love for you is bigger and stronger every day and you should know that you’re the most wonderful person in my life, your heart and mine were made to be happy together. Maybe I’m a fool for not giving you a present but it happened because I can’t concentrate in anything when you’re in my mind. Accept this letter as a gift of love. I wish you a happy birthday my love, you are all I want and need in my life. You’re the prettiest girl my eyes have seen in this world and I’m lucky to be part of your life. Keep this love letter in a safe place; it’s the symbol of the love between us. 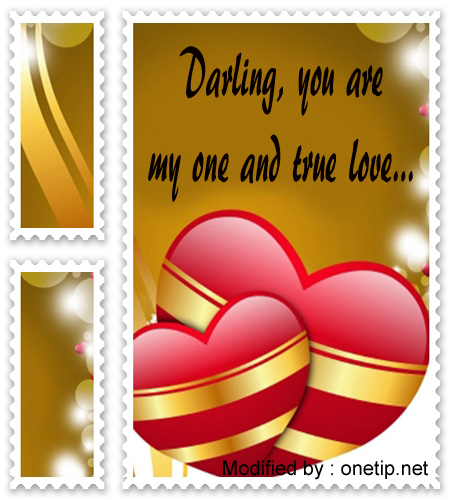 Romantic love cards for her 1,2,3,4,5 : Original images courtesy of “Cuteimages”/ FreeDigitalPhotos.net,Modified by onetip.net . I love it these love messages.. thanks !